Being smashed out of the park; on a hiding to nothing; a batsman’s game. There can’t be too many bowlers who look forward to getting the ball in their hand for the shortest form of cricket. T20 is the razzmatazz side of the sport – the game where the lay supporter can rock-up to a stadium, enjoy a beer and see the ball disappear to all parts of the ground. Trying to keep the boundary hits down to a minimum is the name of the game for the fielding side. For the poor bowler – it’s the nighmare scenario – or is it? While T20 will always be a batsman’s paradise – a new breed of bowler has developed which views the shorter form of the game in not such nightmarish terms. Having been first played on these shores at county level in 2003, a new generation of bowlers have grown up playing T20 cricket. And rather than shy away, they relish the prospect of outwitting the power hitters. One such bowler is Lancashire’s young leg spinner Matt Parkinson. The 22-year-old has an enviable record in T20 – taking 39 wickets with an average of 15.61 from 24 matches. His economy rate of 6.86 per over is also impressive – anything under seven is considered to be good. He admits he probably relishes T20 more than both the 50over and four-day game. “I have played T20 at junior level and club cricket from the age of eight so it’s something I’ve grown up with,” Parkinson explained. “For us it’s not a novelty. “It’s on a par with First Class and one-day cricket and for me personally over the last few years, it’s been a competition I’ve done well in. “It’s probably been my main competition and it’s true that the generation now probably take it a lot more seriously than they did in 2003. “I do enjoy bowling in that form of the game as a spinner. The last two years have gone ok and it’s nice to bowl leg spin at Old Trafford because it’s a big ground and the wickets are normallyconducive to spin bowling in the white-ball game. “So I do enjoy it and it’s something I’m looking to keep going with. “I think the 50-over competition is tougher in a way because you only have four men out in the middle overs so it’s tougher than you think to find that man to bring up. “Red-ball cricket is about consistency and not getting bored and that’s something I need to improve on and it’s probably more mental than technical. “I think as a spinner you’re always in with a chance of a wicket in T20, especially at Old Trafford. “In T20 cricket, if you’re a spin bowler things tend to happen, and the middle or late overs are normally when things tend to happen. I think at the minute white-ball cricket is definitely my strongest suit. bit of consistency and experience really. Having helped Lancashire to T20 Blast finals day last year – albeit they were beaten by Worcestershire rapids in the semi-finals at Edgbaston – Parkinson is eyeing another run to the showpiece day. As a junior player, he remembers the Red Rose’s victory in the competition in 2015 and as a Lancastrian understands how much the county is steeped in the history of the one-day game. He said: “It was a low point (losing at finals day),” said Parkinson. good group stage and played well up until then. “But that’s the thing with knockout cricket. You have one off-day and it goes wrong and that’s what happened on finals day. “Lancashire has got a history in one day cricket and that’s something the group is looking to replicate. “We know the success the club had in the 1990s with Glen Chapple,our head coach, and Mark Chilton, his assistant. They were a big part of that. “The group of players we’ve got are desperate to emulate that if not do better. “My first finals day was 2018 but a few of the lads won it in 2015 and got there (the final) as well in 2014 so the last six or seven years have been good to us. Parkinson grew up admiring Andrew Flintoff for Lancashire and England, but admits his big hero is Aussie leg-spinning great Shane Warne. He would love to follow in the Australian’s footsteps onto the world stage and make a big mark in international cricket. 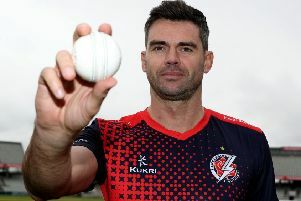 However, he is concentrating on doing well for Lancashire in all formats which will hopefully lead to an England call up. in the moment,” said Parkinson.